aís Vasco is the Spanish Basque country and home to three tiny DOs with barely 125 ha between them. All are close to the coast between Bilbao and San Sebastien. Getariako Txakolina is the furthest east, Bizkaiko Txakolina stretches around Bilbao, while directly to its south is Arabako Txakolina. The best are dry, quite steely whites based on Hondarribi Zuri. The north-western sector of the Rioja DO stretches into País Vasco and includes some of the best of the region’s sites in the Rioja Alavesa. The Rioja wine zone spreads out of the administrative region of Rioja, its borders stretching into Navarra to its north-east and Castilla y León to the west. The wine area is split into three sub-regions: Alavesa, Alta and Baja. Tempranillo performs well in the limestone soils of the Alavesa, which is moderated by cooling breezes, as is the Alta. The latter, though, has more clay in the soil, particularly suitable for Garnacha, which dominates the plantings in the hotter Baja sub-region. Graciano is also planted and makes an important impact on many blends as well as providing the odd striking varietal example. Most wines are a blend of the regions and, while generally the fruit of the Alavesa is the finest, there are outposts of quality in all three. Whites are dominated by Viura with some Garnacha Blanca and Malvasia but few are of the quality of the reds. Of equal importance is the approach of the bodegas. The area has some very substantial producers but quality remains variable. The original ageing classifications of Crianza, Reserva and Gran Reserva are still in place but varietal labels are becoming far more commonplace and many fine new wave premium wines are being produced, which are generally vinified using French rather than American oak, many with the malolactic fermentation in barrel. Some, it has to be said, are very pricey as well. 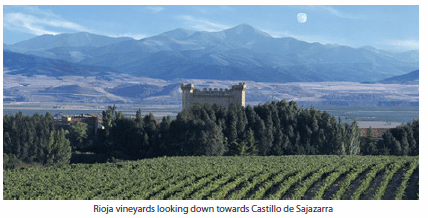 Navarra shares the native Tempranillo, Garnacha and Viura with Rioja but also has considerable plantings of the international varieties; Cabernet Sauvignon, Merlot, Syrah and Chardonnay. Some impressive wines are produced but one often feels price is a key in the producer’s approach and there should be more excitement than there is. To the east and stretching far towards the south of Navarra are the arid plains of Aragón. Bulk wine is generally the order of the day but there are four DOs worth considering: in Campo de Borja and Somontano some very good reds and the occasional Chardonnay and indeed Gewürztraminer stand out. Good, earthy and characterful reds are also produced in Calatayud and Cariñena. Significant old bush-vine Garnacha is a very important resource in both DO’s. Running south from the Pyrenees and along the Mediterranean coast on the Costa Brava is Cataluña, home to a number of diverse wine regions and with its own vast DO which is a source of some top reds in particular. Right up close to the French border a few fine, traditional reds are made in the Empordà DO as well as some late-harvest wines similar to those found in France’s Roussillon region. Some good red and white is produced from the Costers del Segre DO and a vast array of indigenous and international grapes are planted. To the immediate east are the vineyards of Conca de Barberá, cooled by altitude and a source of some good Chardonnay and Pinot Noir, but most of the fruit is sold on. Just inland from the coast and southwest of Barcelona are the vineyards of Penedès, established in a global sense by the considerable efforts of Miguel Torres. Some fine reds and whites are produced, again from a mix of local and international varieties but much of the output is relatively pedestrian. Interestingly the odd low-volume, garage-style red is appearing too. Similar styles are also being produced in the small DO of Pla de Bages, just to the north. Penedès is also the centre of the vast Cava DO. These sparkling wines are made by the traditional method from a combination of local Macabeo, Parellada and Xarel-lo as well as Chardonnay and Pinot Noir. Some very well-crafted vintage and non-vintage bottlings are produced but overall the quality tends to be sound at best. Many operations are very substantial and automation in the cellars is common. Cava at the lower levels can often display a marked rubbery character.. Immediately to the west of Penedès are the vineyards of Tarragona, which has two superior subregions, Montsant DO, which surrounds the small, very high-quality region of Priorat which, like Rioja is a DO Ca. Tarragona is planted to a range of varieties and fortified wines are still produced here. It is the reds, though, that excel and none more so than the superb old-vine plantings of Garnacha and Cariñena. The best can easily rival top-quality Châteauneuf-du-Pape. The reds in Priorat are the wines with the greatest potential. They include a fascinatingly variable blend comprising Garnacha, Cariñena, Cabernet Sauvignon, Syrah, Merlot and Pinot Noir. The vineyards are ideally planted in sparse, finely drained, stony soils and the climate is warm but not excessively so. The red wines of Terra Alta, to the south and inland of Montsant are also worth considering.